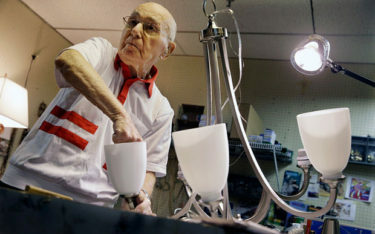 101-year-old Herman “Hy” Goldman, who works four days a week at light fixtures company Capitol Lighting in New Jersey. Mr. Goldman his birthday with colleagues recently after 73 years in the same job. Apart from a brief absence to serve in the US Army in World War II, Mr. Goldman has worked at Capitol Lighting since 1941. The store said Mr Goldman was first hired to sell stock and clean the displays. Colleague Sandy Ronco said Mr. Goldman now specializes in rebuilding items that were damaged or unusable. Mr. Goldman lives in nearby Whippany and still drives himself to work.